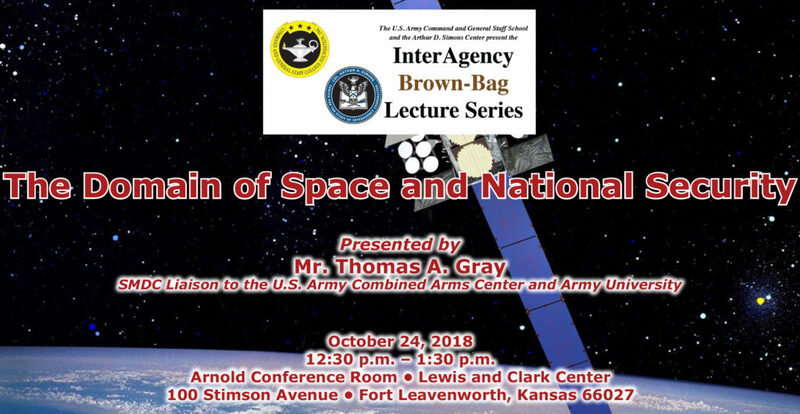 The next lecture in the InterAgency Brown-Bag Lecture Series co-hosted by the U.S. Army Command and General Staff School and the Simons Center for Interagency Cooperation, is scheduled from 12:30 – 1:30 p.m., Oct. 24, in the Arnold Conference Room of the Lewis and Clark Center on Fort Leavenworth. Thomas A. Gray serves as the U.S. Army Space and Missile Defense Command’s liaison officer to the U.S. Army Combined Arms Center and Army University with responsibility for the integration of space knowledge and education across various TRADOC, Joint, and other service schools to include the U.S. Army Command and General Staff College. A retired U.S. Army officer, Mr. Gray was one of the first officers selected to be designated as a space operations officer. He served in Army Space Command, the Space and Missile Defense Lab, and the SMDC Directorate of Combat Development. He is qualified as a Level 3 Space Professional of the U.S. Army Civilian Space Cadre, holds the space operations officer designation 3Y, and has earned the U.S. Army Master Space Badge. Mr. Gray holds a bachelor’s from New Hampshire College and earned a master’s from Central Michigan University.